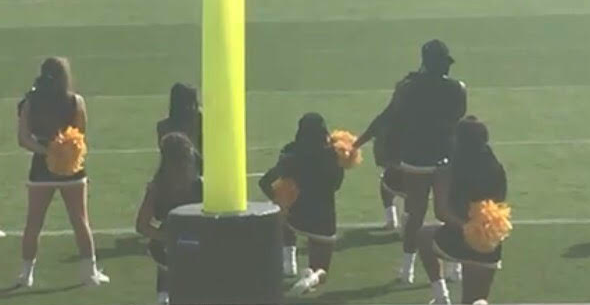 Several cheerleaders at Kennesaw State University took a knee during the national anthem Saturday before the institution’s football team played Texas Southern University. Columnist and activist Shaun King tweeted  Saturday that families of the cheerleaders told him they were being harassed by law enforcement. Kennesaw State spokeswoman Tammy Demel didn’t address King’s tweet or Warren’s statement directly but said that the university respects both the anthem and the free speech rights of the cheerleaders. “Kennesaw State University believes that it is important to honor the national anthem,” Demel said in an email. “It is equally as important to respect the rights of individuals as protected under the First Amendment."